Weddings are all about two families getting together to celebrate and bless a new "union". Weddings are also the perfect opportunity to have a reunion of family and friends that might be spread out around the globe. What better opportunity than to stay together at the cabins of Kudzu Cove. You will not find a more beautiful, peaceful, and natural setting elsewhere. The gazebo overlooks one of our ponds and provides a beautiful backdrop for wedding pictures. The gradual slope of the area in front of the gazebo is perfect for seating as it provides an unobstructed view of the nuptials. For a grand entrance, make arrangements for the bride to be brought to the ceremony in a horse drawn carriage through our breath taking tree lined entrance road. There is also a large flat area just above the Gazebo where a large tent can be placed for the reception. Gunter’s Landing Club House is also available for booking just a few miles away for larger receptions. Kudzu Cove's proximity to Gunter's Landing provides your wedding guests the opportunity to play a round or two of golf, tennis, or enjoy the pool. Your wedding guests can also enjoy the fabulous fishing and activities on renown Lake Guntersville. The Kudzu Cove cabins are ideal as a meeting place in advance of the nuptials for gatherings by the bachelors or the bachelorettes! If you have been in the city too long you and your group has probably forgotten the smells of fresh air, and the clear sky with just the trees around you lighted by the stars. Treat your teams or group to a stress relieving retreat at a relaxed natural setting, in a beautiful comfortable cabin, surrounded by woods. Enjoy a group hike, hit the water for a friendly fishing tournaments, enjoy a night or two around a camp fire, roast some hot dogs and make a few smores. 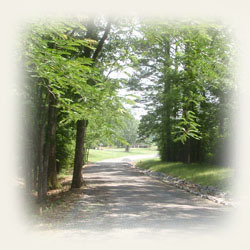 At nearby Gunter's Landing, you can play a few rounds of golf or tennis, or hit the swimming pool. So gather everyone up and come enjoy this simple pleasure.